A 21-year-old man apprehended leaving Holy Resurrection Cathedral here on the evening of Wednesday, June 10, 2015, has been charged with felony charges of Burglary II and three counts of Criminal Mischief III. The suspect allegedly broke a dozen windows and desecrated the altar and numerous interior appointments—including the skufia, wrought iron cross and chains of Saint Herman of Alaska, whose relics are enshrined in the cathedral—in what has been described as a “spree of destruction.” As reported earlier, the relics of Saint Herman remained untouched. On-line donations to assist in the cathedral’s restoration and repairs may be made on-line via the web site of the Diocese of Alaska, or the cathedral’s Facebook page and web site. Donations also may be sent by mail to Holy Resurrection Cathedral, PO Box 55, Kodiak, AK 99615. Established in 1794, the parish’s original church was erected two years later. The current church—the parish’s fourth—was built in the 1940s after a devastating fire destroyed the previous church. It was elevated to cathedral status in 2001. According to Archpriest Innocent Dresdow, cathedral Dean, parish faithful and community members immediately undertook the massive effort to prepare and clean the cathedral for the celebration of the Akathistos Hymn in honor of Saint Herman, held every Thursday evening, on June 11. At its conclusion, a heartfelt message from His Grace, Bishop David of Sitka and Alaska was read. Below, cathedral parishioner Suzanne Bobo describes clean-up efforts and the Akathistos service. Her account includes Bishop David’s words of thanks and encouragement. 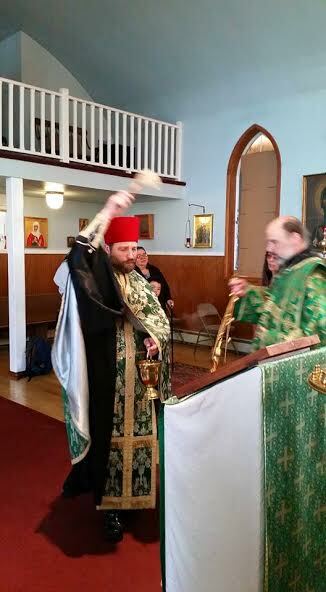 “On Thursday evening, June 11, the faithful gathered at Holy Resurrection Cathedral to celebrate the weekly Akathistos to Saint Herman of Alaska and to pray for the 21-year-old suspect…. With the blessing of His Grace, Bishop David, the altar was re-chrismated after Father Innocent removed the blood that had stained the original white covering from the altar’s consecration in the 1940s and glass shards from the shattered top of the Chrism container. Earlier that afternoon, 12 parishioners and community members came together to continue the glass removal and prepare the church for divine services. A number of parish and community members came to the arraignment hearing and the judge asked Father Innocent to address the court about the impact and consequences to the parish faithful and community at-large…. “Before the Akathistos began, Father Innocent gave an emotional narrative of the damage, progress in the investigation and explanation of what was about to take place. He then invited the faithful to gather at the foot of the amvon to watch the altar be re-adorned. The Royal Doors and Deacon Doors were opened so the faithful could participate in the process as the clergy clothed the Holy Table with a replacement cover (the original green covers will have to be burned). Father Innocent brought each of the holy items out from the altar to show the damage before placing them on the Holy Table. “Once the Holy Table was in order, prayers appointed for the desecration of sacred items by a heretic were prayed from the Book of Needs. Upon completion of these prayers, the clergy and faithful processed throughout the entire church and outside sprinkling Holy Water and singing the troparion to the Cross. In the midst of grieving, the faithful experienced the grace of Pascha. “After the blessing we began the Akathistos triumphantly before the open reliquary. Saint Herman’s damaged monastic cross was placed at his head. His chains were placed upon his chest and his skufia at his feet. A copy of the Hawaiian weeping Iveron icon was placed below the Myrrh lines left in the lid of the coffin when the original icon was placed in the reliquary last July and streamed Myrrh up into the lid of his coffin. “After the dismissal the following message from His Grace, Bishop David was read to the faithful. “With the blessing of His Grace, at a date to be determined, desecrated items will be transported by boat accompanied by clergy, faithful and community members. The holy items will be burned in Monks Lagoon, on Spruce Island. By the grace of God, nothing of antiquity will have to be burned.